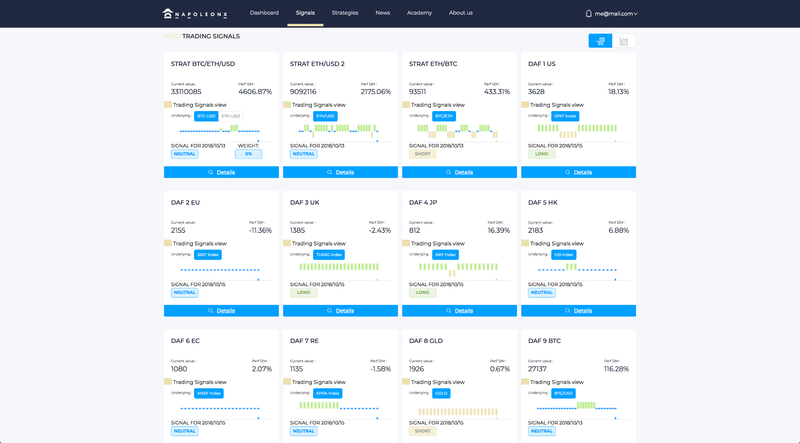 Trading signals on our first 10 algorithms, including Bitcoin, global stock market indices (S&P500, Eurostoxx50, FTSE100, NKY, HSI, MXEF, sectorial indices (EPRA, Oil&Gas), and commodities (Gold). 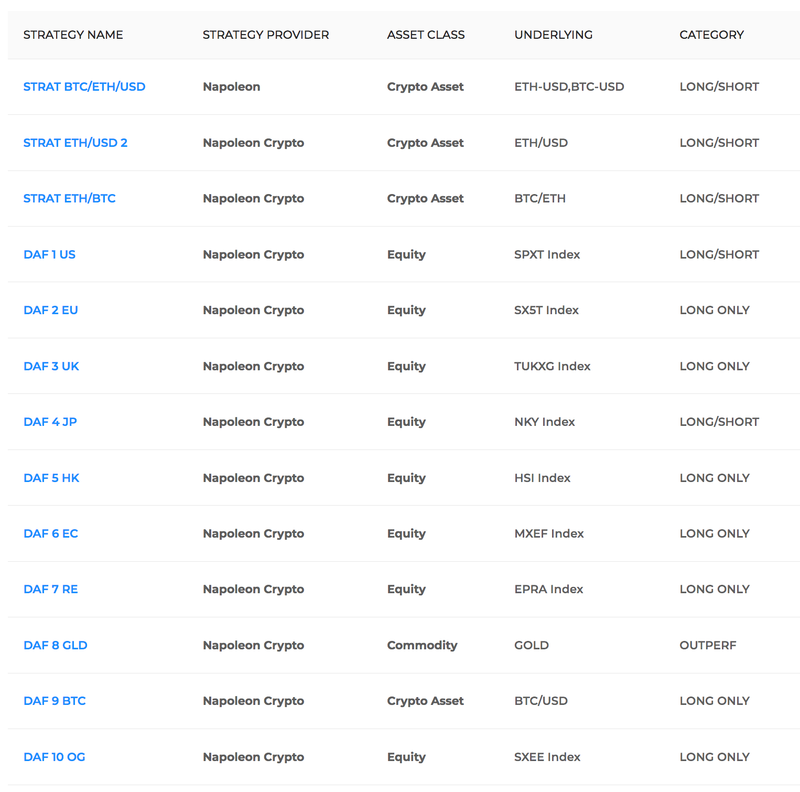 Depending on the new strategies developed in-house, on time-limited offers and on your account level, you may also have access to additional trading strategies (see below). Revenue sharing (85% of the performance fees) on the first 10 investment vehicles (DAFs) to be launched by our asset management company. 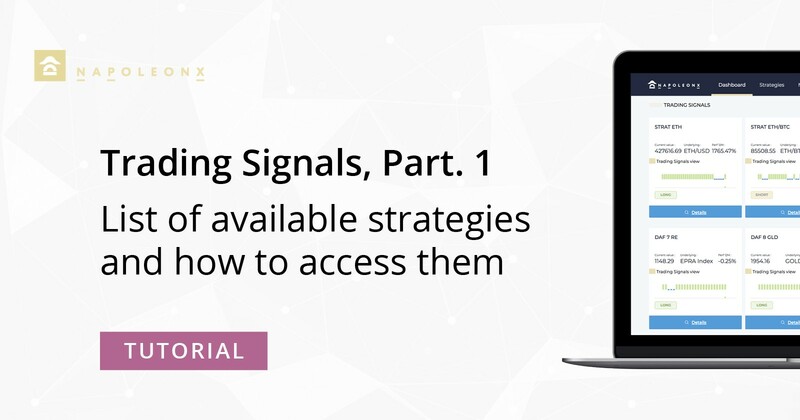 In this first part, we will deal with the first topic, specifically the trading strategies available and how to get access to it. To learn how to read and use the signals, see the second part. NapoleonX has designed and run more than 20 non-correlated, high-performance and scalable absolute return & market timing models over the past 10 years — and our library is still growing. Our value proposition is underpinned by these long-standing, algorithmic proprietary strategies that run on a variety of highly liquid assets, both on financial and crypto markets. 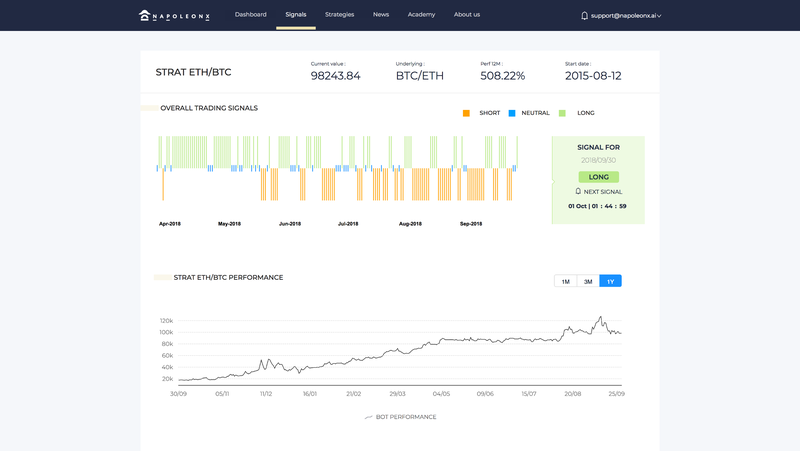 * The ETH/USD and ETH/BTC strategies as well as the BTC/ETH/USD allocation model have been introduced on top of our 10 first algorithms as a bonus for our token holders until our first Decentralized Autonomous Funds (DAFs) are launched. They will remain available free of charge with no minimum threshold until then, but they might be restricted to certain membership account types after that— e.g. Gold (+1k NPX) or Platinum (+10k NPX). Strategies that may be added later on could also be restricted to upper-tier accounts. For more information on our membership program, see below. To have permission to access the signals, you must hold at least 1 NPX token and have registered the corresponding address on the NPX Platform. For more information on the registration process, see our tutorial. Once your tokens have been registered on the NPX platform, just log in and access the Signals tab. This tab gives you an overview of all available strategies and of their current position (long, short, neutral). From there, you can click on any strategy to access detailed informations, including the time of the next signal, historical data and performance graph. 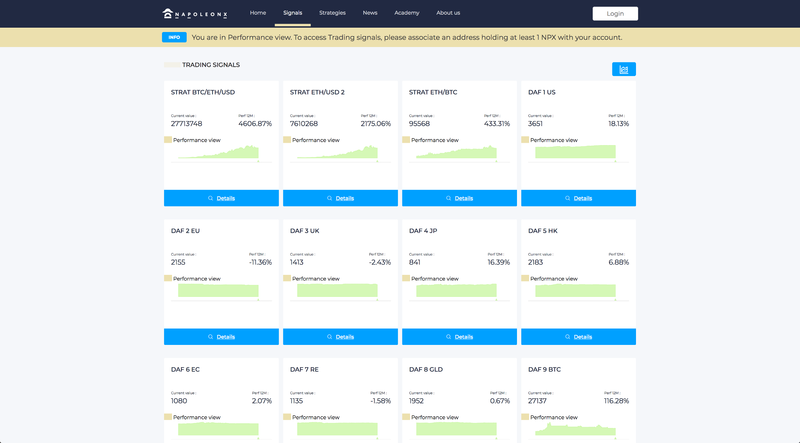 Note: If you don’t have NPX tokens and/or if you haven’t registered the corresponding address(es), you will be able to view the strategies’ performance indicators but you won’t have access to the trading signals. Details of a strategy showing the time of the next signal, historical data and the performance graph. NaPoleonX having specialized in low- to medium-frequency strategies, our trading signals are updated daily at market close. +10k NPX (Platinum): get signals 15 min prior to market close. Note: Market opening and closing hours are available here (third-party website — we assume no liability). Crypto markets being open 24/7, closing time is set at 00:00 (12:00 AM) UTC for the crypto strategies. Beyond the first 10 algorithms (and DAFs) that we have committed to provide our token holders with as per our Whitepaper, additional strategies that we may add in the future could be restricted to upper-tier accounts. For instance, our ETH/USD, ETH/BTC and BTC/ETH/USD strategies have been introduced on top of the first 10 as a bonus for our token holders until first DAFs are launched. They will remain available free of charge with no minimum threshold until then, but could be restricted to upper-tier membership account (e.g. Gold or Platinum) later on. None of Napoleon Group, its members, directors, officers, agents or employees accepts any responsibility or liability whatsoever or makes any representation or warranty, express or implied, as to the accuracy or completeness of the information, or any opinions based thereon, contained in the NapoleonX platform, and it should not be used in place of professional advice. Additional information may be provided on request, at our discretion. Any scenarios, assumptions, historical or simulated performances, indicative prices or examples of potential transactions or returns are included for illustrative purposes only. Past performance is not indicative of future results. Investors may get back less than they invested. Napoleon Group gives no assurance that any favourable scenarios described are likely to happen, that it is possible to trade on the terms described herein or that any potential returns illustrated can be achieved.